Item Code:Sheetfed offset ink Features:Speedy-Iso comply with European color standard 12647-2 , and it is certified by SGS for ROHS, En71 and ASTM. SPEEDY: The advanced "Hitrigel" technology in Speedy-ISO process colors from KINGSWOOD are manufactured to give the best press performance in terms of high damping solution tolerance , combined with super high gloss ,good setting time and excellent rub resistance. 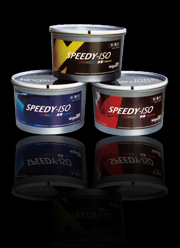 Speedy is for customers who is looking for high quality and intensive strength fast setting international standard inks. For all machine types. Stable performence for multi-color press,+15000/hour,long or short run works. Speedy-Iso comply with European color standard 12647-2 , and it is certified by SGS for ROHS, En71 and ASTM . The product is well accepted in Europe, North America and Middle East, and stand out for its high gloss, bright colors, low dot gain, quick set speed and suitable for coatings and stay open over night.